The physical manifestations in Alabama, focusing on the city and county of Montgomery, were shaped through the lens of slavery, racial inequality and legally supported abuse of racial minorities. Montgomery was one of the most highly transited depot for domestic slave trade, which translated into the presence of exploited labor since then. The waterways and railway served as the gateway as navigational tools to transport the cotton and disguised domestic slave trade through boats as well as railroads, fueling the flourishing economy in Montgomery. Since the 1900s, dams were created along the river for the distribution of water and energy to an expanding city. The placement of man-made lakes, caused by the creation of the dams, such as the Martin lake and Logan Martin, flooded many towns which at the time 1920s was mainly lands inhabited by African Americans, as well as some cemeteries, a time where their needs wasn’t deemed as equal. Before the Civil War, slavery cultivated the prosperity of cotton. After the war, white and black tenant farmers displaced slave labor, and let diversity of crops arose. Now thousands of undocumented immigrants working in the farms and poultry plants, props the modern agriculture in Alabama. The unstable population shaped the system of agriculture in Alabama in 150 years, in which the mobility of the population has a profound influence. Since then, advanced mechanization and modern industry developing in the southern states shifted the role of laborers: a transformation from agriculture to manufacturing industry. A definite growth of Alabama industry did not happen until the interference of slaves that came through Alabama river and interstate railroads in the 19th century. With an extraordinary increment of African American population, they were the essential drones that kept the labor cost low and manufacturing industry vigorous. 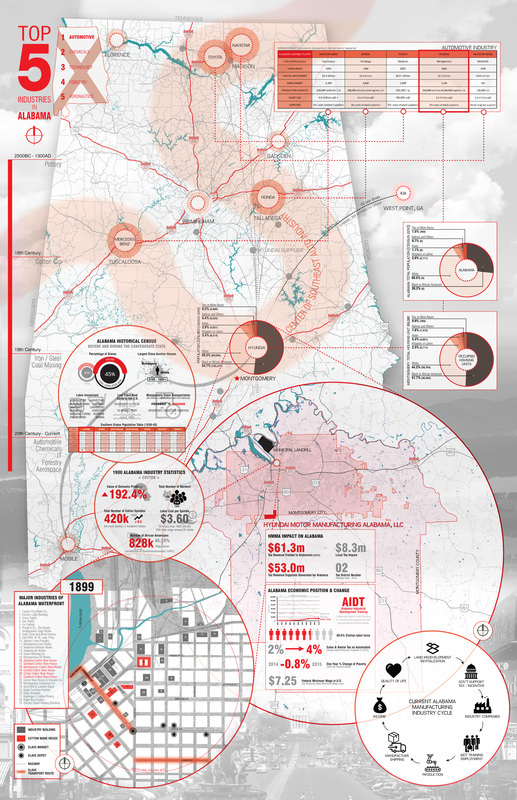 Through the great migrations for several decades, conventional cotton production and allocation of modern industry such as automotive, chemicals and IT from the Northern region embraced Alabama to maintain the basis of its economy until nowadays. ​Public transportation systems represent important places for confronting racial inequalities in the United States. The history of the civil rights movement shows the importance of transportation to people of color. At the time African American activists were walking the streets of Montgomery to protest segregated buses, and the federal government was funneling massive amounts of investment into the construction of highways, which disproportionately benefited middle class white families being able to move to the suburbs through low-interest loans. People of color were not only excluded from these types of loans and thereby isolated in the urban core, but also many minority neighborhoods were demolished by the highway construction. The changing nature of exploited labor have carved out a racial landscape the state of Alabama.